AM I READY FOR SENIOR COMMUNITY LIVING? What is it I’m not ready for? Often, people confuse moving to a retirement community with giving up all the things they hold dear. We think you may find today’s retirement commu­nities to be far different than you might have imagined. They’re for people who want to maintain their independence, expand their horizons, and make their own decisions. So residents enjoy life more — not less. How will I know when I’ll be ready? Do you worry about home maintenance? Are you tired of shopping and pre­paring meals? Do you have health concerns? Are you troubled about per­sonal safety and the security of your home? Would you like to explore new interests and meet new friends? If so, now is the time to experience the free­dom a service-enriched retirement lifestyle can offer you. Why should I consider a move if I’m still healthy? Can you think of a better time to move? Most people need to make hous­ing adjustments as they grow older, and our residents tell us they’re glad they decided to move while this important decision was still theirs to make. You’ve planned ahead your whole life, so don’t wait until a crisis forces you or your loved ones into a decision you haven’t prepared for. Will I have to move again if my health fails? Most SRG community residents never have to make another move! While we encourage healthy, active, independent living, we realize that circumstances change. That’s why we provide access to a full range of health care options. Throw away your misconceptions about retirement living. Senior living com­munities are service-enriched residential communities, not an institution or rest home! Enjoy the advantages of an independent lifestyle within a com­fortable and burden-free environment. You’ll free yourself from the daily concerns of meal planning, home repairs, and maintenance, while filling your time with new friends and a variety of social, cultural and recreational op­portunities. Begin researching in advance — before the need arises. A good place to start is to ask family, friends and valued advisors, such as a trust officer or estate attorney, for their recommendations and help with re­searching retirement communities. The Internet, professional resources, se­nior directories, local newspapers and social circles may also provide helpful information. Determine which type of senior community will best fit your needs. 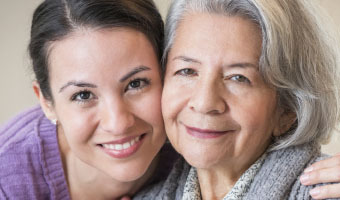 It’s important to understand the different types of senior assisted living op­tions that are available and the types of services and care they offer. From continuing care retirement communities (CCRC’s) which require upfront entrance fees, to “rental” communities which offer similar services with the flexibility of a monthly fee, there is a community to fit every budget and life­style. Narrow the list of potential communities. Take into account location, care services, amenities and activities. Working from a checklist — matching your preferences and needs to those being of­fered — can be very helpful in the selection process. Tour retirement communities in your area to best evaluate your options and get a feel for their “culture.” Sample the dining services by visiting for lunch. Or, attend a community event or social — there are numerous low-key op­portunities which provide fun-filled, no-pressure invitations to mingle with current residents and preview the community. It will most likely take more than one visit to make a decision as to whether or not a community is right for you. Make an appointment with a community representative to go over any additional questions you may have. Remem­ber, they have a wealth of knowledge and are there to help you to determine the perfect mix of services and amenities to meet your needs. DOES A RETIREMENT COMMUNITY MAKE SENSE FINANCIALLY? When compared to the monthly expenses and upkeep of a house, many of our residents have found that they actually spend less per month and gain countless additional benefits by moving to a retirement community. Download and complete the “Compare the Value worksheet”. Schedule a meeting with one of Senior Resource Group’s Senior Living Specialists to discuss which retirement lifestyle, floor plan and care servic­es best match your needs and budget. Investigate the resources available through the Internet to determine how you may qualify for special benefits available to you as a resident in a li­censed retirement community setting. Senior Resource Group has a number of valuable resources and programs to help you make the transition as smooth as possible. Contact a professional Realtor to assess the true market value of your home. Speak with a Senior Living Specialist to discuss financial/funding pro­grams that may be available. IS THE COMMUNITY CARF ACCREDITED? The Commission on Accreditation of Rehabilitation Facilities (CARF) is an in­ternational, independent, not-for-profit organization that accredits providers of human services focused on the areas of rehabilitation, employment, child and family and aging services. Its mission is to promote and ensure the qual­ity and value of the services provided. When it comes to choosing retirement living, you deserve the very best. You can learn a lot by visiting a community, but how do you measure the qual­ity behind the scenes? At SRG, we put ourselves to the test and voluntarily asked Commission on Accreditation of Rehabilitation Facilities (CARF) to review and rate just how well we are doing. We’re proud to announce that every eligible SRG assisted living community met and mastered over 1000 rigorous standards earning CARF’s highest level of accreditation. Not only were we the first nationwide provider to initiate the process, but we’re also the only licensed provider to have all of its eligible communities accredited. So when you’re shopping for retirement living for you or a family member, consider the SRG difference and make sure you add CARF accreditation to your must-have list.